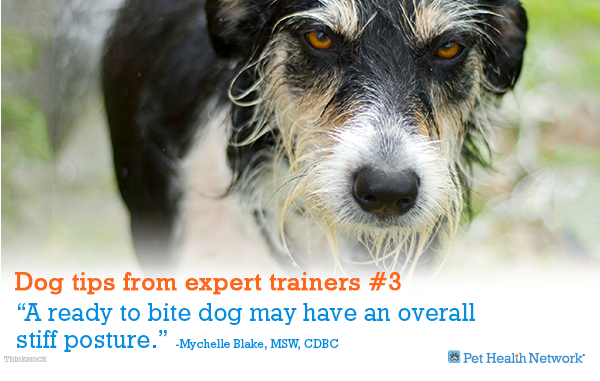 Mychelle Blake is the Chief Executive Officer for The Association of Professional Dog Trainers (APDT). Pet Health Network recently interviewed her on the topic of avoiding dog bites. 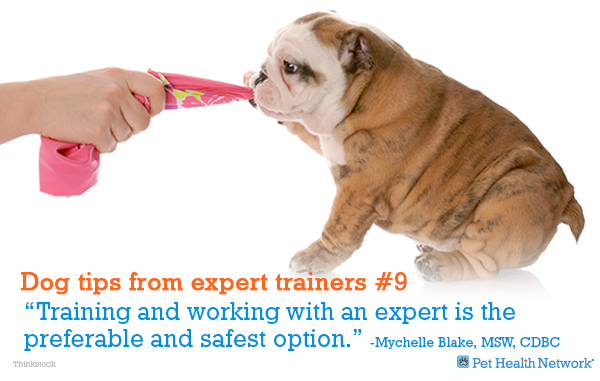 Mychelle worked with Katenna Jones, Director of Educational Programs for the APDT, to supply us with these important answers. 1. What are signs someone should look for before approaching an unfamiliar dog? 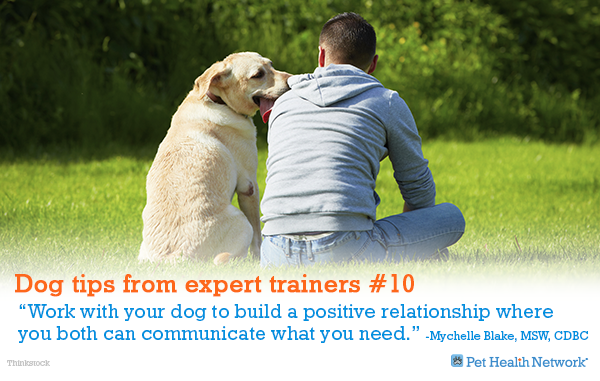 You want to look at their overall body language – does the dog seem relaxed, does it approach you on its own, etc.? If you see signs of stress, this is a big red flag to give the dog its space. Signs of stress include hard stares, freezing, growling, lip licking, excessive yawning, panting, pacing, “hard” (taut) body language throughout, hackles up, tail up and straight or wagging but in a stiff motion, tail tucked under in fear, barking continuously, body blocking, and more. We usually use the following analogy: you want to look at the entire body of a dog to understand what he’s saying. A common misconception is “a wagging tail means the dog is happy.” However, the meaning of a wagging tail can vary based on context, much like the meaning of single word would vary depending on context. Instead, think of each part of a dog’s body – the eyes, ears, tail, fur, body tension, and so on – like individual words. Combine them all together to form a “sentence” to better understand what a dog is saying. 2. If a confrontation does occur, what should I do? Talk to the dog in a quiet voice. (This is more to keep you breathing steady). You want to give the dog some space so he feels less threatened. If the dog does lunge at you, remain calm and try to put as much space as you can between you and the dog. If the dog continues to come at you and you fear for your safety, you can try to put something between you and the dog: a piece of clothing, a purse or whatever you have handy. If the dog happens to bite and hold, for example, your arm, try not to pull back as this actually can encourage the dog to bite down harder and will cause more serious injuries. Instead, do your best to push into the dog — avert your eyes and try to stay calm. Wait until he releases so you can move away. 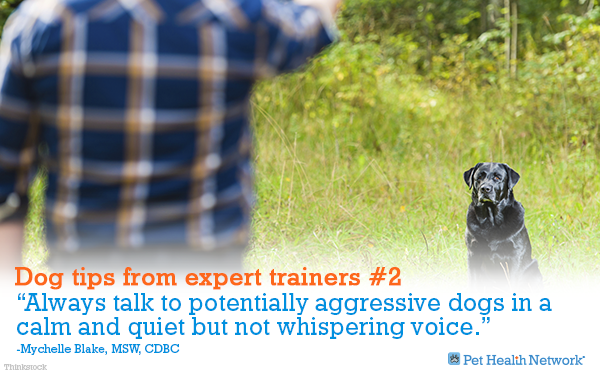 Do NOT make the dog more agitated by screaming, yelling, and/or running during an attack. 3. What are some of the signs that a dog could be getting ready to bite? Signs include hard stares/whale eyes, growling, pulled back lips, hackles up, and an overall stiff posture. Be aware, though, that some dogs will not give many signals. 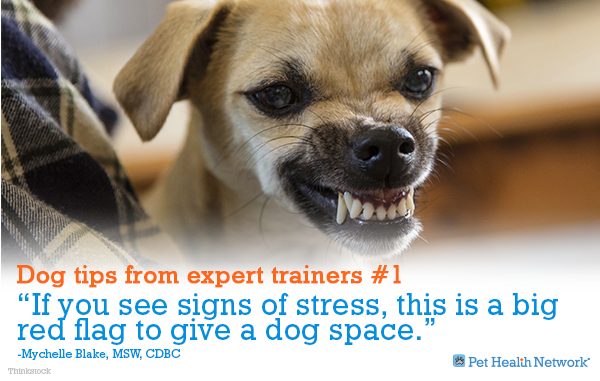 A big mistake that owners often make is to punish a dog for growling when they’re fearful. This teaches the dog that growling is bad, and then they feel forced to move immediately to the next step which is biting. So if you feel uncomfortable around a dog, really pay attention to the minutest details of their body language. 4. In your experience, what are the most common reasons a dog will bite a person? The vast majority of bites occur on the property where a dog lives. Of those, the overwhelming majority are unneutered males who are chained outside. Generally, the cause is fear, frustration or anxiety and being put in a situation where the dog feels threatened or unsafe. The dog, whatever the specific circumstance, feels that biting is his only option to end whatever is happening to upset him because he hasn’t been given an alternative behavior to go to. 5. Should I begin to teach an aggressive dog submissive behavior? 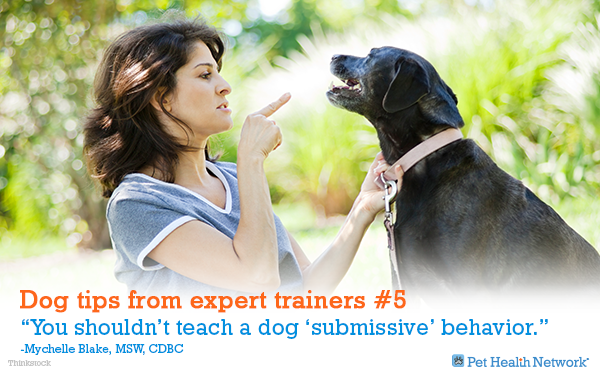 You shouldn’t teach a dog “submissive” behavior – that is a very common misconception. Instead, work with a qualified professional to develop a behavior modification plan that desensitizes the dog to whatever stimulus is causing him to get upset. Use management and environmental enrichment to help give the dog sound behavioral options to move toward. 6. How do I discourage play-biting? 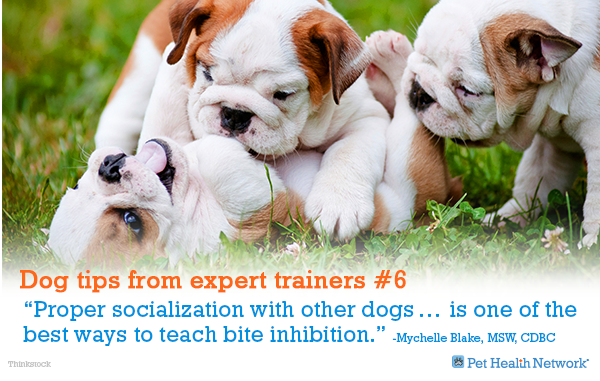 Proper socialization with other dogs when your dog is a puppy is one of the best ways to teach bite inhibition. If the dog puts teeth on your skin, you can gently redirect him to something appropriate to chew on, such as a toy or a chew. Praise the dog for chewing the acceptable item. You can make a yelping noise to get the dog’s attention if he puts his teeth on bare skin, and make sure you praise him profusely for moving away from your skin. Playing tug can actually also help with this. 7. Can certain medical conditions cause aggression in dogs? Yes, absolutely, which is why a good behavior consultant or trainer will always require you to have a full vet check-up prior to beginning any behavior modification plan. 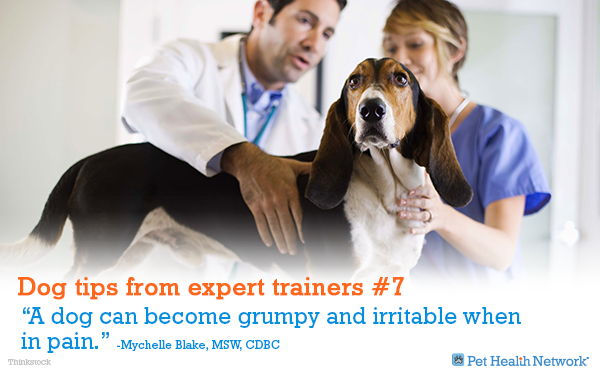 Just like with people, a dog can become grumpy and irritable when in pain. Other medical issues, such as problems with thyroid levels, vision loss, age, and more, can contribute to aggressive behavior. 8. How early should I start socializing my puppy to get him used to being around people/other pets? As soon as you possibly can. If you are concerned about vaccinations, have the dog meet adult dogs that you know and bring them to puppy classes where proper cleaning protocols are observed. 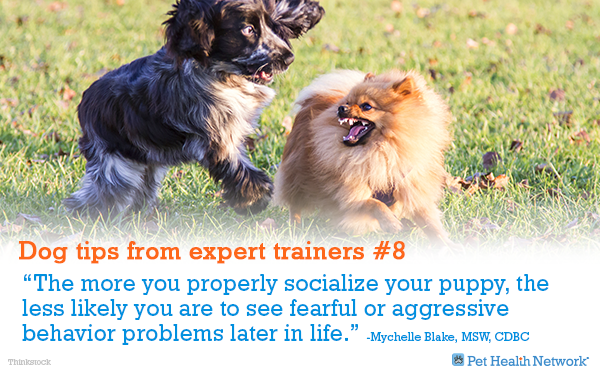 There is a very short window of time for proper socialization and the more you socialize your puppy, the less likely you are to see behavior problems in the future. The optimal times for puppies to interact with other dogs is between 3-7 weeks and with humans is between 8-12 weeks. 9. How should you deal with a puppy that growls if you take away his toy/bone? I would recommend consulting a trainer or behavior consultant experienced in this behavior ASAP. This is an issue that, if not handled properly, can cause irreparable damage to the dog. Visit www.apdt.com or www.iaabc.org for someone who can assist you. There are so many factors involved in behavior training and working with an expert is the preferable and safest option. 10. Do we really want to be dominant in our relationship with dogs? The key takeaway is that you should work with your dog to build a positive relationship where you both can communicate what you need in your own species-specific ways. A dog and owner should not be seen as being locked in some sort of battle of wills. The misuse of dominance terminology and theories has only led to conflict, fear and frustration on the dog’s part and is a key contributor to dog bites.